Surely, you’ve uttered those words after asking a vendor for their price. I’m often shocked at the price of certain items. With that in view, I thought it a good time to look at the prices of some of the finer things. If you’re in the market for a new ring, here is the most expensive diamond in the world. The WINSTON BLUE DIAMOND weighs in at a hefty 13.22 carats and can be snapped up for a paltry $23.8 million. Perhaps you’re in the market for a new production vehicle, then the ROLLS-ROYCE SWEPTAIL may be for you. You can lose 20% of it’s value when you drive this $13 million baby off the lot. If that’s out of your budget then you can grab one of the cheaper most expensive cars, the MCLAREN SPEEDTAIL for just $2.2 million. If you’re like me, you’re saying, “I’ll never spend more for a car than I would my house.” So, you’re looking for a house? If BUCKINGHAM PALACE were on the market, you could grab it for $1.5 Billion. Unfortunately, it’s not for sale; however, you can pick up the VILLA LEOPOLDA, VILLEFRANCHE-SUR-MER in France for just under $800 Million. All of these are likely out of your price range, so let’s look at a few ‘cheaper’ things. At $11,000 per night you could take a vacation at NORTH ISLAND IN SEYCHELLES. If you’re a bit more adventurous you could spend just one night at WHITE DESERT “GREATEST TRIP” TO ANTARCTICA. This trip of a lifetime will only set you back $195,000 for the 24-hour trip. That’s just $8125 per hour…or perhaps you could visit for a few minutes at just $135.42 per minute. These things are just luxury items anyway, how about we look at some more practical items? The most expensive suit of clothing will only set you back $895,000, THE STUART HUGHES DIAMOND EDITION. Each one of the three suits ever made takes over 800 man hours to design & stitch the finest wool, cashmere & silk into this magnificent work of art. We all need clothing, right? Moving onto food, how about THE FORTRESS STILT FISHERMAN INDULGENCE? You’ve gotta eat, and this fine dining experience is a mere $14,000. To wash it down, there are beverages ranging in price from $225,000 up to $3.5 million. That’s some shopping list, but we don’t come here to give recommendations like Yelp. No, we need to talk spiritual matters. For most, if not all of us, these pricey things are way out of our league. We’ll never experience such worldly pleasures. However, what would we do for much less, much less? 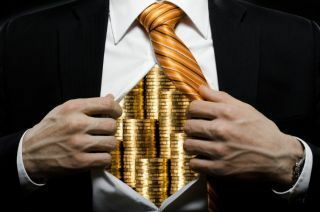 “For what is a man profited, if he shall gain the whole world, and lose his own soul? or what shall a man give in exchange for his soul?” [Matt 16:26]. By the way, you can pick up everything that could be bought for just $241 trillion (based on the combined world GDP). You see, when we reject God’s plan for us, His plan of salvation through Christ Jesus, we place a higher value on things that will one day burn up over the great cost paid for your soul. [2Peter 3:11]. This Website contains the instructions for God’s plan of Salvation. Let’s go to heaven together, shall we? Is One Denomination as good as another? IT ALWAYS amazes me when someone explains how one denomination is as good as another regarding worship or salvation. 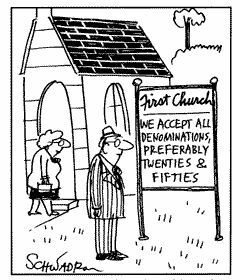 Denomination, by its very definition means division. Today, there are around 33,000 Christian denominations in the U.S.
One reason there are so many denominations is because of the variety of teachings. Some teach baptism by sprinkling, others teach no baptism at all. Still others teach sin is wrong whereas others teach no repentance is required. You can join a black only church, a woman church, or even a church of Satan! Is this what Jesus had in mind when He built His church? “For God is not the author of confusion, but of peace, as in all churches of the saints.” [1Corinthians 14:33]. Let’s illustrate why this fallacy of “any denomination is as good as another” is wrong. Look at our own currency. 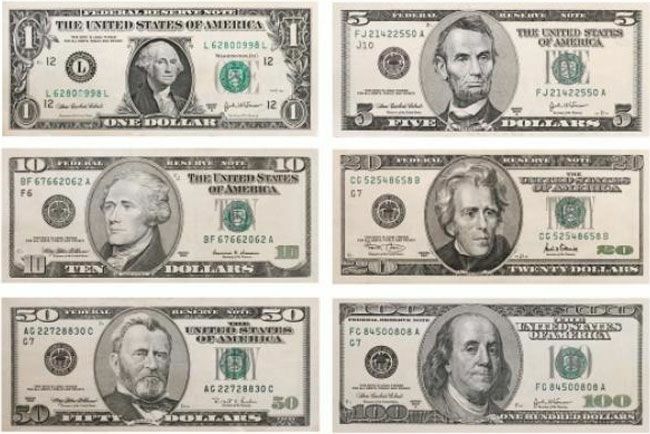 We call the different size bills, denominations. Jesus said, “I will build MY church.” [Matthew 16:18]. He didn’t say “churches” plural, He said “church” singular. Jesus sent the Holy Spirit who instructed Paul to write, “there is ONE body” [Ephesians 4:4], and the body is the church, [Ephesians 1:22-23]. The reason there are so many denominations comes down to this one point; error. Jesus said, “Ye do err, not knowing the scriptures,” [Matthew 22:29]. We are supposed to teach the same thing [Mat 28:20], when we do we will be added to the one church that Christ has built. ” . . . (they) tell me they do not believe in making preachers rich. Neither do I. But, brethren, I do believe in making them comfortable, in supporting them this side of want, and in affording these faithful men the means of schooling their children well. Is this right? But why, pray, do you not believe in making preachers rich? Do you think it would hurt them? You cannot say it would; for you have never made one rich, to know. Suppose before you longer preach your doctrine with so much confidence in its truth, you test it by making at least one preacher rich. Hitherto you have kept them all poor; let us now have at least one exception to your rule. You are satisfied that it works well both ways. Preachers are not at all satisfied that you are right in what you say, neither will they be until, by making at least one of them rich you convince them that you are so. Do you think it would hurt you to be rich, or hurt your children to educate them well, and thereby enable them to move in genteel circles? Of course you do not. How then can you imagine that it would your preacher, or injure his children to make him rich? You tell me it would cause him to neglect his calling. But how do you know this? You have never made one rich, to have the point tested. Would making you rich cause you to neglect your calling? Why then should you think it would cause the preacher to neglect his? The closer you stick to your calling the richer you grow. Think you not, if the preacher, too, could grow daily richer by sticking to his calling, that he would not stick to it close indeed. But the difference is, that the closer you stick to your calling the richer you grow, while the closer he sticks to his the poorer he grows. Is there not something wrong? But tell me truly, faithful brother, do you preach this doctrine really believing it. Is it really so that you do not believe in making preachers rich, and that, too, because it would hurt them and cause them to neglect their calling? Or is not this a mere plea to shield your own purse? Beware” (Lard’s Quarterly, September. 1863, Volume One, pp. 37, 38). The other day in the panhandle of Texas, I heard of a lady that had been kicked out of her apartment by her boyfriend. She had called her former employer, this person had only used her once to clean a rental house, seeking help. She wanted to avoid any shelters so as to be able to keep her kids, though her kids were with other people. She had no money, no one to turn, no place to go zip, nada, nothing. How do you live an honest life, lacking nothing? Would you like a life like that? Honest living, lacking nothing? There are little treasures in the scriptures that God gives us to better enjoy our lives. He said in 2Pet 1:3 According as his divine power hath given unto us all things that pertain unto life and godliness, KJV. These “things” are more than just the churchy stuff. He provided information about life. 1Th 4:12 That ye may walk honestly toward them that are without, and that ye may have lack of nothing. Here we see a worthy ideal, having an honest life toward folks, and a lack of nothing. This verse says “that ye”, meaning that the formula is in the previous verses where we find the 4 step formula…. Let’s break this down for you…..
LOVE – In vs9 He says that we are to love one another, then in vs10 to “increase more and more“. We should do more than just increase, but that He was urging us strongly to make this increase. Notice the word “beseech“. Pursue PEACE– In vs11 we see “study to be quiet“, meaning that we need to seek peace, a quiet life. Do you see how these first two steps can really change how our lives unfold? Had I told this to certain audiences, they would reject this formula simply for being from the Bible. If I were to share this without the scripture reference, they would hail it as just good ‘ole common sense. These things work whether you’re a believer or unbeliever……..
……if you’re an unbeliever, then what’s the point of any of this? If you don’t have a hope of heaven in Christ, then you’ve got nothing and that is one bridge you want to keep from burning. He’s told us how to cross that bridge too. Click here to see what saves you.